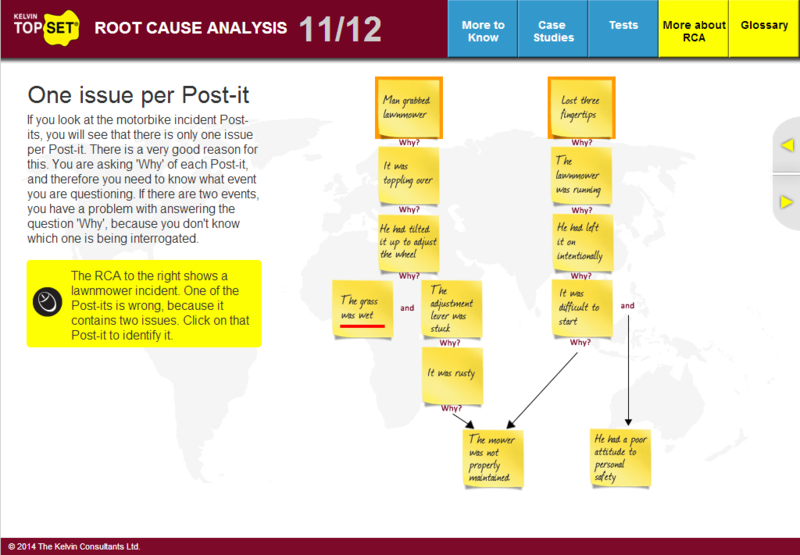 Learn the fundamentals of good Root Cause Analysis in as little as 4 hours by completing the Kelvin TOP-SET e-RCA course. With over 30 years’ experience of teaching incident investigation and of investigating at all levels for multinational companies, Kelvin TOP-SET recognises that, for many people, getting to the real root causes of incidents poses a challenge. 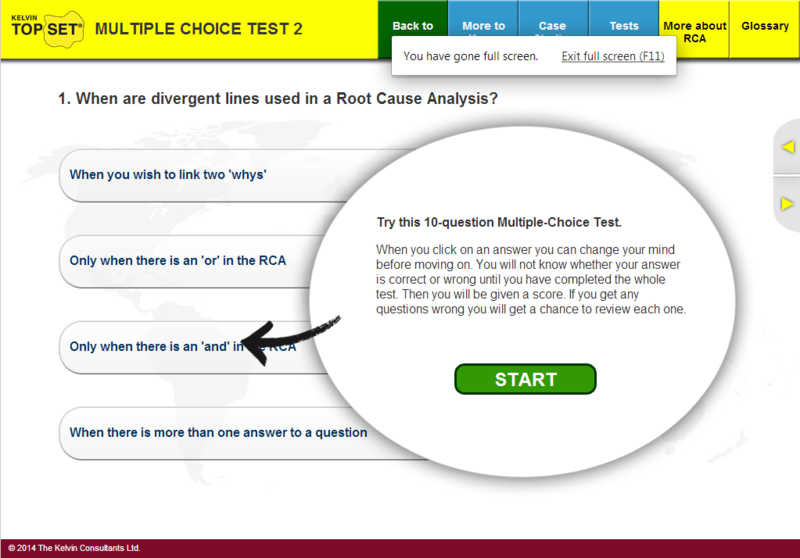 With this in mind, Kelvin TOP-SET now offers the e-RCA course, a short online Root Cause Analysis course. Learn how to successfully conduct a Root Cause Analysis and practice and perfect RCA thinking whilst enhancing your problem solving skills. 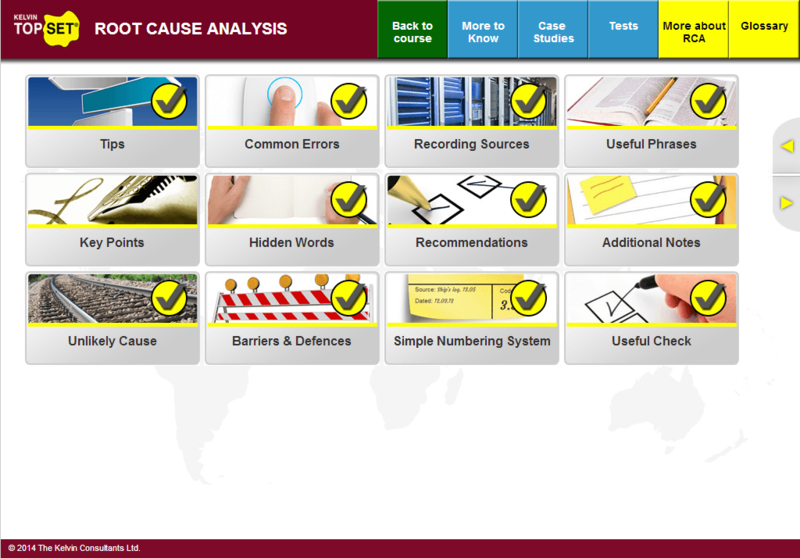 The course can be completed online in approximately 4 hours and requires no prior knowledge of Root Cause Analysis. It is suitable for anyone who may be involved in incident investigation and for those who simply wish to gain a better grasp of the fundamentals of good RCA. Participants are awarded the Kelvin TOP-SET e-RCA Root Cause Analysis certificate on successful completion of the course. "The course has far exceeded my expectations, both in the way it has been set-out and in the way it is packed with informative, useful information. The content of this course exceeded any other e-training course that I have completed and I would definitely recommended this course to others. e-RCA is an excellent course which I thoroughly enjoyed. The course has been made exceptionally interesting for the learner and it became very addictive working through the scenarios." "More Bang For Your Buck. How e-learning can help businesses to increase productivity and keep costs down when it comes to training"
Certification: Kelvin TOP-SET e-RCA Root Cause Analysis Certificate on successful completion of the course. Corporate Licences Available - ask us about our preferential rates. Free licence for those who are registered Kelvin TOP-SET in-company tutors.